Do you see her? Look to the lower right corner, behind the diagonal line. ...Mary and I went back to the Brookdale Lodge just last month and stayed a couple of nights. It's a rather bizarre place to begin with even without it's ghostly reputation. The above was excerpted from an e-mail from the brother of fabulous, skydiving Pat Lang. And aside from providing the cover ghost for this edition (thank you! ), the pic inspired me to research Santa Cruz. Let me tell you, although the Brookdale Lodge is perhaps the most famous haunt, the place is just lousy with tragedy, ghosts, and scandal. The ghastliness goes back at least as far as Native American history and legend. At least three Indian burial grounds have been discovered within city limits. The local Ohlone tribe told tales of a sycamore grove off of what is now Highway 9, which housed a spider whose web would entangle only those with dark secrets, and of a giant snake in the redwood forest that killed indiscriminately. There is a story of a young Ohlone man who defied the tribal elders and was executed by them for his trouble. He cursed the land, and at a later date, it was invaded by a tribe from the Stockton area. The Yachicumne, who considered the Ohlone &amp;quot;unathletic&amp;quot; at best, slaughtered so many of the locals that a person could transverse most of what is now Santa Cruz without ever touching the ground for all the skulls and bones and gore. Since then, the town has seen numerous catastrophes, including severe earthquakes and a fire in 1894 that reduced the town to ashes. In 1898, on the day news of the Spanish American War reached Santa Cruz, there was an explosion at the Powder Works that blew out windows up to three miles away. Nine Irishmen died on the spot and were buried in a mass grave at the Odd Fellows cemetery. Also killed was a young bride who stepped out on her porch and was struck on the head by a rock thrown more than a mile by the explosion. There were several other deaths related to the incident, but nobody knows for sure how many. The 1870s saw the origin of two of Santa Cruz's most famous ghosts. One begins with a city elder named William Waddell, who lost his arm to a protective mother bear. It was buried in a meadow, but when the rest of Waddell died and the locals tried collect all his pieces, the arm could not be found. Ever since, the area has been plagued by small thefts, blamed on the sticky fingers of the mutilated arm. The other is a mail order bride from Massachusetts who was forced to wear her wedding dress every night whilst her drunken husband beat her. When he learned of her plans to leave him, he pummeled her to death, cut off her head, and burned down their house with her body inside it. The shade of a woman wearing white has been reported in the neighborhood in subsequent decades. Though the spirits of misused or otherwise tragic women in white are commonplace, they are usually benign. The one that roams Santa Cruz, however, is notable for her vile temperament. She has been known to slap people around and curse a blue streak. There is also a story of her throwing an axe, at either an old drunk or a little boy, depending on which version you read. All the ghost advisories warn readers to steer clear of this White Lady. A few of the other ghosts of Santa Cruz include a woman murdered by her boyfriend on the Red, White, and Blue Beach. The spirits of a woman in a Victorian-era dress looks for a book upstairs, a man in glasses dwells downstairs, and an angry dog barks in the basement of the Rispon Mansion. Three rooms in the B-Building in the University of Santa Cruz (the &amp;quot;Bermuda Triangle&amp;quot;) were host to heavy poltergeist activity before being shut down for good. The ghost of a student who committed suicide wanders Building A, and the spirit of a transient named Lily walks in a nearby meadow dressed either in rags or nothing at all. In 1898, Major Frank McLaughlin--financially ruined, disinterested in political opportunities--shot his little daughter and poisoned himself on the second anniversary of his wife's death. The spirit of the little girl has been see in the drawing room of the Golden Gate Villa where she died, and floating around its gold plated chandelier. On the evening of August 18, 1961, hundreds of shearwater seabirds slammed into the homes and businesses of Santa Cruz. People attempting to escape were attacked by the birds, which were attracted by headlights and porch lights. The following day, two truckloads of the dead animals were collected and destroyed. Theories to explain the birds' strange behavior were proposed (an unusually heavy fog? toxins in the bay? ), but no conclusions were ever reached. There are still occasional shearwater attacks in the region. The incident, combined with Daphne du Maurier's novella, formed the basis of The Birds, directed by Santa Cruz's most famous part time resident Alfred Hitchcock. 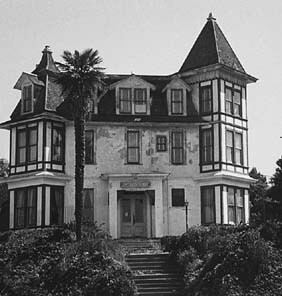 Hitchcock was also inspired by the Kittredge family mansion in Santa Cruz. Built in the 1860s, the house changed hands multiple times and became progressively seedier as the decades passed, eventually becoming a magnet for drug dealers and Satanists. In the sixties, new owners bought it and remodeled it as the McCray Hotel. Soon after, their son began seeing ghosts there. In the eighties, the building was remodeled yet again as the Sunshine Villa Assisted Living Retirement Center. But though the structure has a new respectability, the nursing staff still report cold spots, flashes of blue light, and disembodies voices. The building's most lasting fame, however, is as the inspiration of the Bates Mansion in the original Psycho. Speaking of creepy hotels, we come to Brookdale Lodge. Opened in 1870 as the headquarters of the Grover Lumber Mill, the building was bought in 1900 by H.J. Logan who converted it into a campgrounds and hotel. The Lodge's heyday was between 1922 and 1945 when it was owned by Dr. F.K. Camp. It was Camp who commissioned the famous Brookroom, a dining hall constructed around a stream that changed course in 1922. A strict Seventh Day Adventist and Prohibitionist, Camp kept a close eye on his guests, which included Mae West, Marilyn Monroe, Tyrone Power, Joan Crawford, Rita Hayworth, Hedy Lamarr, and Herbert Hoover. At least three songs were written about Brookdale Lodge during this era, including "My Brookdale Hideaway," "A Place Known as Brookdale," and "Beautiful Brookdale Lodge." Camp sold the property in 1945, and it changed hands several times throughout the rest of the 40s and into the 50s. Absent Camp's stern control, the site became a draw for gangsters and other shady types. Hidden rooms and secret passageways were installed in the grounds, and rumors of bodies buried beneath the dining room floor persist to this day. It was during these years that Sarah Logan, niece of the original Lodge owner, was drowned in the Brookroom creek. Her ghost is the one most often seen--and perhaps photographed by Pat's brother--usually running around the dining area, and sometimes asking guests to help her find her mother then mysteriously vanishing. A spectral woman has been seen walking over the brook, as if crossing a bridge that had long been removed. The scent of gardenias often suffuses the room though there are no gardenias on the property. The sounds of a dinner party are faintly heard even when the room is empty. The phenomena are not restricted to the Brookroom. Doors slam without any discernable reason and disembodied footsteps are heard throughout the property. The Mermaid Room, so called because of its proximity to the hotel's pool, was closed in 1972 after the drowning death of a thirteen-year-old girl; but the jukebox stored inside it has been known to turn itself on and off, and soft sounds of voices and clinking glasses have been heard from the empty room. Big band music has also been heard in the Fireside Room and the Pool Room though the source of the music could not be located. A man in period dress has been glimpsed standing at the hotel bar long after closing time, and a lumberjack nicknamed George haunts the conference rooms. Ghosts are also rumored to infest the cabins that were built on the old campgrounds. The occupant of number 46, who lives there and does odd jobs on the property, has reported seeing spectral faces and witnessing poltergeist type activity in her home. All in all, psychics have discerned up to 49 ghosts in and about Brookdale Lodge. Most cities with long histories have ghost stories, but the above only scratches the surface of Santa Cruz's paranormal scene. But if those stories are not intriguing enough, there's also the Santa Cruz curse that states that men who do not marry by age 30 are doomed to lives of endless promiscuity. Sounds like something that deserves investigation.